Yarra Yarra Golf Club is located on the Warrigal Road south of Melbourne’s city centre, very close to Commonwealth and Metropolitan. Unlike most of its peers in the Sandbelt, there is a distinct shift in scene and strategy between the two nines. The front nine, the first seven holes of which are laid out on land north of the elegant brick clubhouse, are of a more intimate nature. The 402-metre par 4 5th, which strokes 2 on the card, is a strong hole but the other holes on the nine call for controlled and accurate striking. The second nine is roomier and the fairway targets on the par 4s and 5s are on the generous side. The drama is stored up for the complicated green complexes that have been developed at Yarra Yarra. In your favour are the best putting surfaces in Australia, a dense and compact mat of green and enviable trueness. Here a ball goes exactly where struck and we have cause to envy the members at Yarra Yarra who enjoy this as a matter of course. The course at Yarra Yarra Golf Club is one of the most memorable golf experiences in the region. Play once and your memory will be indelibly stamped with images of the handsome brick clubhouse, the shifting nature of the nines, the peerless greenkeeping and the flow of holes. The club started out as the Eaglemont Golf Club in 1898, before moving to Rosanna in 1911 to become the Yarra Yarra Golf Club, with members playing on a course laid out by M. G. B. Jefferson. 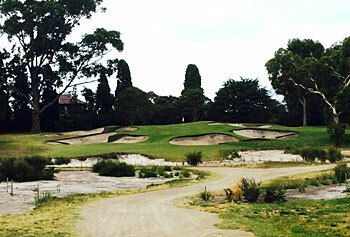 In order to have a course based on sandy soil instead of clay, the club moved again to its present location at Bentleigh and it was here that Alex Russell’s first solo design was officially opened on 23 February 1929. Phase one of the restoration, led by Brian Slawnick, completed in September 2018 and there's little doubt that when the job is finished Yarra Yarra will climb the Australian rankings. As you turn off Warrigal Rd, through the gates and along the entrance road it becomes clear that you have entered a world class facility. The presentation resembles the old classics around the world. The Spanish style clubhouse adds to the drama. Yarra Yarra is a 'sandbelt course' and is built on rolling sandy terrain ideal for golf. It does not have the elevation changes of Royal Melbourne or Victoria but the quieter movement enabled Alex Russell to build a different style of sandbelt course. Over the years inevitably changes were made by well meaning officials, and more recently the club appointed Martin Hawtree to oversee changes to the course but it didn't work out, and Tom Doak's Renaissance men were asked to assist instead. One of Doak's most experienced men- Brian Slawnik- became the man on the ground- and the changes were welcomed. The recent work by Brian Slawnik has returned the course to the look and feel Russell espoused. The course had become a little overgrown, so trees and undergrowth have been cut back, allowing the spectacular bunkering to dominate. The green complexes are the key to the course, and they have once again become the focus. The greens themselves are pure poa annua, but have always played firm and true. The bunkering is clean and crisp, and now Slawnik has added more turf around the greens as run offs and to provide a turf connection to the next tee. The combination is impressive. Yarra Yarra was a torchbearer when it introduced equality for women members from the outset. The course has always appealed as a venue for womens golf because it is a relatively easy walk, is not overly long, and is challenging but quite playable for players of different abilities. Brian Slawnik's restoration work has met with the club's focus on improving the quality of the course for member play rather than tournament set ups. Integrating tees with greens has helped with the flow of play, and with reduced carry off the tees, and a new set of forward tees Yarra Yarra will cater for children, elders, those with slow swing speeds- as well as the stronger golfers. Yarra Yarra is one of 8 clubs in The Melbourne Sandbelt- one of the great golfing destinations in the world. It is not a long course, but it is a championship course, and is a nice complement to Royal Melbourne & Kingston Heath… As such it should be on every golfers wish list! The Home of the awesome Beez! - Robert Allenby and Stuart Appleby. I had reciprocals at Yarra Yara and played it about 5 times. I found the staff friendly and generally the condition of the course was always good. I agree with the comments about the opening par 3, a slightly downhill 200m hole with a flat open green (at least you can birdie it with a good shot:-). The other par 3s are challenging with many bunkers protecting the elevated green, and you usually approach them at an angle as the tees are not lined up as you would expect but at about 20-30 degrees from the line of the green. Some of the par 4s and 5s are good, and then some are average. Again if you are visiting Melbourne and intend playing all the sand belt courses, you should play it, but it is not RM or Metropolitan or Victoria. Depending on who you talk to, this is either the best members sandbelt course or just an average collection of holes. To me is it somewhere in between. The opening hole, a long par 3, is completely wrong, especially when you consider the amazing quality of the other par threes - the 11th is rated the best of the sandbelt and amongst the best in the world, and given the competition in the sandbelt, alone, it really has some stiff competition. Perhaps the problem with this course is that the people who designed it and then tinkered with it, never really understood what sandbelt golf was all about, and the opening hole is the perfect example of this lack of awareness. Too many holes simply have a park land feel to them, rather than the sandy, tea tree bracken of native vegetation. Sandbelt golf is all about wide fairways, lines of tees, great bunkering and super fast greens. The rough should be unkempt, sandy waste. Don't get me wrong, it is a fine course, always in top condition and challenging enough, with fast greens and fine bunkering. However, unlike its sandbelt cousins, it never excites. Worth a visit, but only if you are playing other courses in the area.